Nearly 20 years in, salmon recovery organizations understand what salmon need to survive: healthy habitats, ability to travel freely from home rivers to the ocean and back, and hatchery and harvest management decisions that work in harmony with habitat recovery. In three areas of the state, salmon are making real progress toward viability. Below are examples of successful recovery efforts. Summer chum populations are increasingly strong and nearing recovery goals. Scientists believe these fish will be recovered within the next decade. They are watching the chum to ensure the fish can withstand changes in their habitat caused by climate change. The abundance and spatial distribution of middle Columbia River steelhead populations have improved significantly during the past decade. Many of the populations in the Klickitat, Rock Creek, Walla Walla, and Yakima basins are nearing recovery goals, and a population has reestablished in the White Salmon River now that Condit Dam is gone. Steelhead have benefited greatly from habitat restoration and passage projects. Steelhead have benefited greatly from habitat restoration and passage projects. Much progress has been made removing fish passage barriers, increasing in-stream flows, and improving habitat conditions in all of these areas, with strong support from local communities. Unfortunately, the past 3 years have seen relatively low numbers of adult salmon returning because of poor ocean conditions. The region is optimistic that the significant improvements in freshwater habitat conditions that have been achieved will allow a rapid rebound as ocean conditions recover. Caution is advised in moving toward delisting prematurely, but with the right ocean and river conditions, there is reasonable potential for delisting of Hood Canal summer chum salmon from the protections of the Endangered Species Act within the next decade. Restoration efforts also increased the overall length of time juvenile Chinook spent in estuaries in the Skagit, which gave them more time to grow and resulted in greater fish survival. Similarly, in the Nisqually River estuary near Olympia, restoration of about 900 acres resulted in fish staying in the estuary 30 percent to 75 percent more of the time, giving them time to transition from freshwater to saltwater. This chart shows funds distributed ($981,781,151) by the Washington Recreation and Conservation Office from 1999-2017. The Recreation and Conservation Office is a state agency that administers multiple funds and staffs multiple boards, including the Salmon Recovery Funding Board. The total above does not include the local matching resources, which would bring the statewide total investment to more than $1.2 billion. It includes the following fund sources: State Sources: Aquatic Lands Enhancement Account, Brian Abbott Fish Barrier Removal Board, Catastrophic Flood Relief program, Coastal Restoration Initiative Grants, Estuary and Salmon Restoration Program, Family Forest Fish Passage Program, Puget Sound Acquisition and Restoration Fund, Salmon Recovery Fund, Washington Wildlife and Recreation Program. Federal Sources: Coded Wire Tag Program, Environmental Protection Agency, hatchery reform funds, Land and Water Conservation Fund, Marine Shoreline Protection, Pacific Coastal Salmon Recovery Fund, Pacific States Marine Fisheries Commission, and Puget Sound Chinook critical stock program.How do I get more information on the projects? 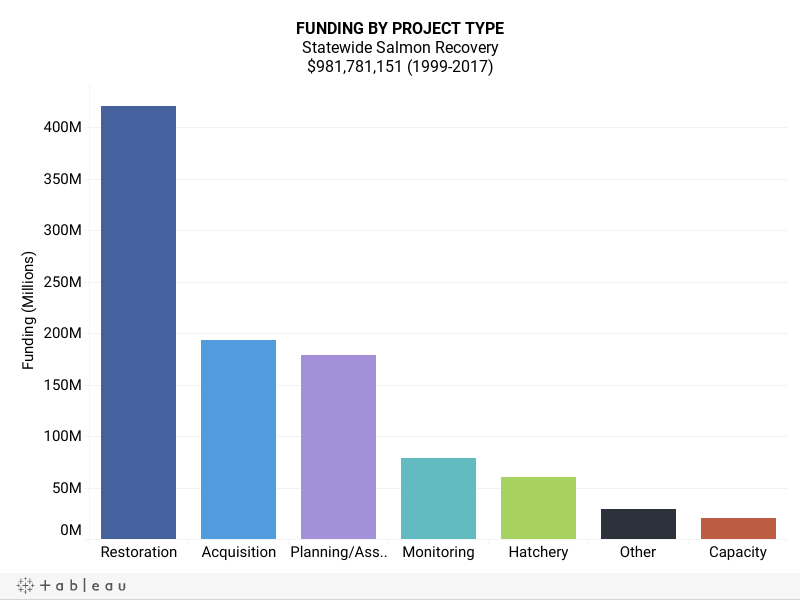 The Salmon Recovery Funding Board awards funding to projects during public meetings and presents detailed information online to ensure the funding process is visible and accountable to the public. Information on individual projects can be viewed on the Recreation and Conservation Office’s Project Snapshot and the Habitat Work Schedule.